DigiCore Australia introduces their unique GIS Map Rendering Service. Being leaders in IVMS/ GPS Tracking since 2007 has given DigiCore Australia significant experience in processing customers’ maps for IVMS/ GPS Tracking purposes. We have been rendering mine map aerial imagery, vector files of roads, features or topology and public features such as nationally recognised gas infrastructure and land hydrology information for many years. The purpose has always been to provide our IVMS/ GPS Tracking customers with the ability to see their vehicles under IVMS/ GPS Tracking management monitored in relationship to their own, known maps. DigiCore Australia would typically render this information into custom mine maps to display in customers’ online IVMS tracking windows. This information can also be utilised to provide IVMS/ GPS Tracking users with more accurate and concise violation reporting thanks to better visualisation of speed zones, such as the Safer Together working group dataset. 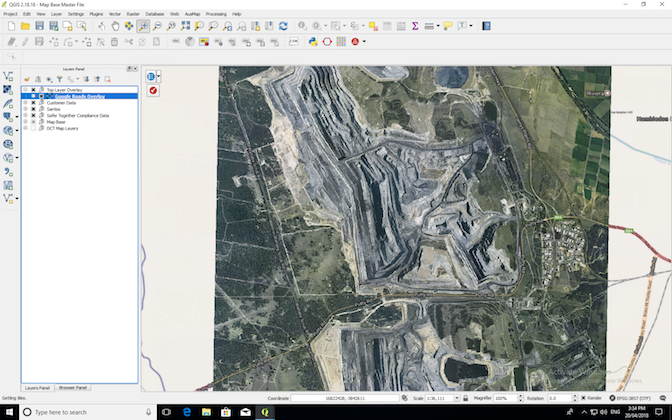 Mine map imagery can also be used in our customer’s internal applications via our tile server – we would like to offer this as a service to our IVMS/ GPS Tracking and other customers. We will process your map tiles and present to them you via a unique URL. Please contact us for more information, even if you are currently not one of our IVMS/ GPS Tracking customers – we would like to get specifications from you from where we would be able to provide you with a quotation to process and present you map tiles.